You are here: Home / Hunting / Do You Make Your Own Jerky or Sausage? 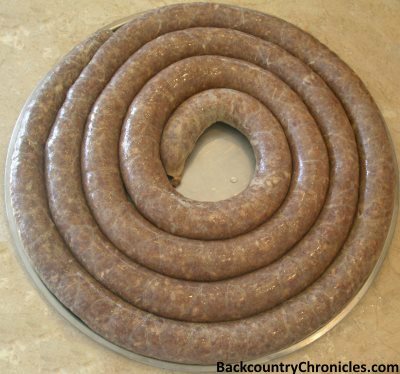 Elk Polish Sausage before Twisting into Separate Links and Smoking. I was fortunate to harvest both a deer and an elk last Fall. After butchering, we made plans to make several types of sausage, so we needed sausage casings. In the past, I’ve only found them in the big city, but I was on my way to the local grocery with a slim hope of finding them locally. On the way, I saw my neighbor (a hunter) in his yard, so I stopped to ask if he had any casings or knew where to find them. When he asked what they were, I assumed he didn’t understand my Southern accent. He calmed down after realizing most of the sausage he had eaten in his life were probably stuffed in natural hog or sheep casings and it hadn’t hurt him yet. Then he seemed intrigued that I was going to make sausage from my deer and he instantly started asking all kinds of questions about making sausage. During our conversation, he told me except for the backstraps, he really didn’t like venison and that he usually made jerky from the rest of the venison. Now, I was surprised. I don’t know why he doesn’t like venison, but to turn the whole deer into jerky? I like jerky, but that’s a lot of jerky. Earlier, other neighbors also got very excited when they saw my deer and the first question they asked was when I was going to make jerky. When they learned I planned to make sausage, they also seemed puzzled. It was like I was breaking a rule I didn’t understand. I guess I need to make some jerky too. After talking to my neighbor, I wasn’t surprised that neither of the two grocery stores in our town had casings. After an online search and a few phone calls, I made a trip into the city. Believe it or not, but I found sausage casings at Whole Foods Market. For anyone needing casings, just ask the butcher at their meat department. Anyone wanting to avoid a trip into the city can find sausage casings online. Our first two batches of sausage was a smoked andouille sausage (in casings) and a simple breakfast sausage without casings. I shared samples with the neighbors. The andouille must have been a little spicy (as I knew it would be – another cultural difference), but they all liked the breakfast sausage and wanted the recipe. After sharing more hunting stories and childhood memories, a common theme was that jerky was a favorite of all since they were kids, but since jerky was the most expensive way to process meat, it was always in short supply. I found this surprising for two reasons; First, none of them or their relatives butcher their own animals and second, they paid the butcher to make jerky. Despite the trend towards taking deer and elk to the butcher instead of doing everything yourself, when it comes to processing game, there is a huge cultural difference between where I grew up in the South and here in the Inter-mountain West. It makes perfect sense because it is so easy to make jerky here in the dry climate and difficult in humid climates. It might be hard to believe for those of you in humid climates, but on a hot dry day, I can hang t-shirts on the clothes line and the first shirt will be dry before the last shirt is hung up. That is dry enough to properly dry jerky in the Sun without a dehydrator as people have done for thousands of years. I can dry a full batch of jerky in the dehydrator in about 4 hours. I haven’t lived in the South since 1992, so it has been a long time since I made jerky in a humid climate. I didn’t have a dehydrator then, so I used the oven. I set the oven on the lowest temperature (200° F) and propped the door open. I don’t remember exactly how long it took, but I made jerky. The meat was more cooked dry than dehydrated, but I don’t remember spitting any of it out. It was good, but the best jerky is not made in an oven. Also, heating the house with the oven isn’t a good thing when the outside temperature can be 85 – 90°F even in October. 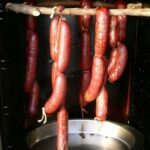 In the West, with jerky being a favorite and so easy to make, there is little reason for people to try making sausage. That is – until your transplanted neighbor rocks your world. Before refrigeration and canning, the only way to preserve meat was drying, smoking or salting. But we don’t make sausage or jerky today just because we need to preserve food, we make it because we like the taste. Like almost everything else we invest time and energy into, making sausage can be very simple or very complicated. Sausage can be made from meat and fat cut into large chunks or finely minced without special equipment or it can be ground with hand or electric grinders. Sausage can be made into patties or rolled into links like ground meat or it can be stuffed into casings using special sausage stuffers or with a simple funnel. Sausage can be smoked for added flavor or simply fried up in a pan. 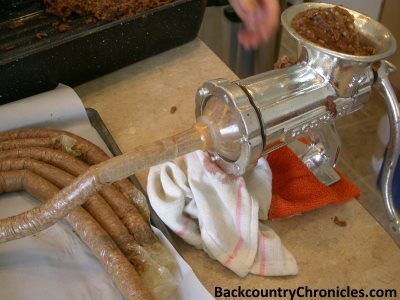 Stuffing sausage into casings with a hand grinder. We have a manual meat grinder that I have had for many years and an electric grinder that was a gift. They can both grind coarse, medium and fine. I prefer the hand grinder for small batches and for the fact that it is quiet. The electric grinder is useful for large batches, especially if working alone, but we wear ear protection when using it. That may seem silly, but I am approaching 60 years old and I can still hear the faintest sounds in the woods. Check back, other recipes will be posted soon. Now… I need to teach the world about livermush.